Just because it’s a cold, wet, and miserable winter outside doesn’t mean you have to put up with paying high utility bills. Sure, it’s always a good thing to add more insulation to your home, but this can be inconvenient and expensive. Thankfully, there are many smaller things you can do to improve your home’s energy efficiency during the winter months that can save you a tidy sum from your energy bill, and they’ll keep working for you throughout the year. So, to get your started with some ideas, here’s our 5 tips for winter energy efficiency. Isn’t it more energy efficient to keep my home at the same temperature all the time? No. The cooler the interior of your home gets (relative to outside temperature), the slower the heat loss. In other words, your home loses heat energy more quickly at 72 °F (22.2 °C) than it does at 62 °F (16.7 °C). By not heating your home as much when you are not there or not being active, you can save both energy and money. Remember that cranking your thermostat up or down dramatically doesn’t affect how quickly it will heat or cool your home. How fast your home heats or cools depends mainly on the weather outside, the efficiency of your HVAC system, and how well insulated your home is. Doors and windows don’t always close as snug as they should, and that can end up adding to your heating bill. Check the weather stripping on your doors and windows to find cold drafts. If you can close a tissue in a door or window and still pull it free, then you’ve got draft problems. Fortunately, weatherstripping is usually inexpensive and can easily pay for itself within one year. Drafts can also sneak under doors, so check along the bottom of doors to be sure the sweep is working. Replacement kits are inexpensive and easy to install. Also be sure to weather-strip your attic door so that it closes snugly as well. 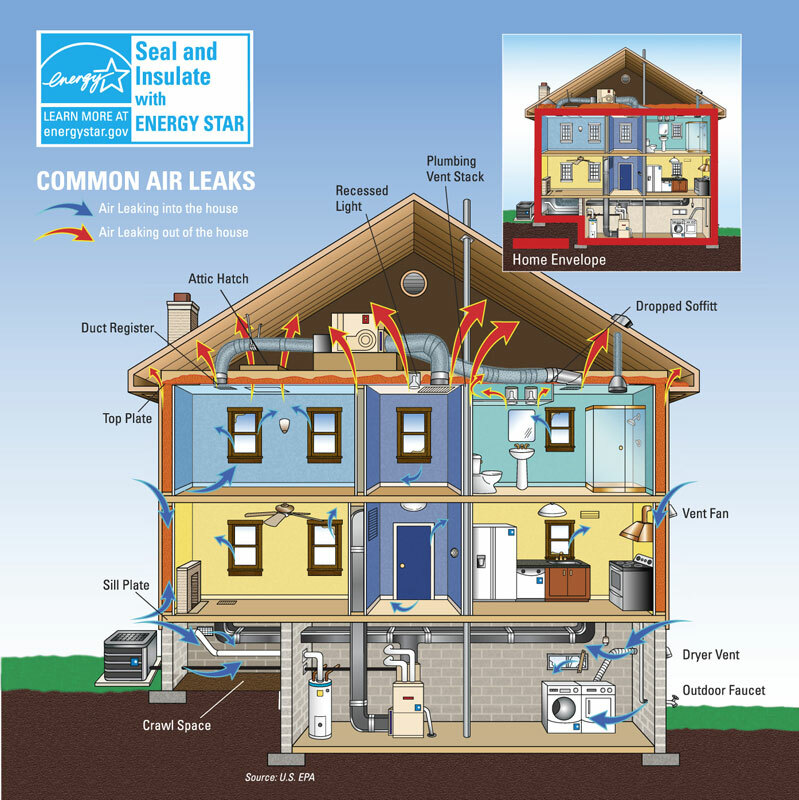 Check out the EnergyStar Air Sealing page for the complete guide to seal your home. Plain curtains can reduce heat loss from a room by 10%. Thicker, insulated drapes that can fasten together and are hung close to the window can save up to 25%. Homemade window quilts are not only highly effective but easy to make and make for cozy decoration to upstairs bedrooms. During the day, open your curtains on southern facing windows to let in the sun. When it comes to really drafty windows, it’s best to seal them off with an indoor shrink-film insulation kit. More often than not, many home owners forget to reverse their ceiling fans’ direction during the winter months. While ceiling fans don’t actually heat a room, they pull warm air up from the center of the room and circulate it down the walls. Not only does this even out the room’s temperature, but by increasing airflow down exterior facing walls, it blows behind furniture where air could stagnate and cause mold and mildew. Just be sure to wipe dust off the blades before turning the fan back on. Clogged furnace filters are the most common cause for poor air circulation and poor heating in a home.Not only do they force fans to work hard, they can also reduce the lifespan of your Heating, Ventilation, and Air Conditioning (HVAC) system. That’s why its important to replace dirty filters every three months with ones specified by the manufacturer. You’ll also enjoy the benefits of better air quality in your home. Remember to keep the return air registers free of obstructions and to occasionally wipe dust and pet fur from them to allow air to flow more freely. Reduce your energy costs this winter with these easy tips to save you money now and also during this summer’s cooling season. While some take a little time and a little skill, these small jobs can improve your home’s value and make it more comfortable all year long.